2003 Domaine des Baumard Savennières Clos du Papillon: Retail $30. Under Stelvin. I picked these up from the PLCB a few years ago, and this is the third bottle we have twisted open. I do not know if there is any wine that has a characteristically better nose than an aged Savennières, and this seems to have a few years at least to go. Tons of tree fruit here: peach, pear, apple. The fruit is more subdued on the palate, but vibrant acidity and a killer finish that last for minutes…. Outstanding. 90-92 Points. NV Herbert Beaufort Champagne Brut Grand Cru Carte d’Or Tradition: Retail $50. Basically, I am of the opinion that if a Champagne says “Bouzy” and “Grand Cru” on the bottle, I am certain that I am going to like it. This wine surprised me, though. It was tart, granny smith kind of tart, and did not have as much backbone and body that I expect from Bouzy and Beaufort. Nonetheless, this is a beautiful bottle of bubbly, but I will bide a bit before breaking open another. Outstanding. 90-92 Points. 2006 Bergström Pinot Noir Cumberland Reserve: Retail $50. This bottle was decidedly better than the previous as there was more fruit and complexity and a wonderful pairing for the grilled salmon. Still, it was a bit lacking in acidity, coming off just a bit flabby, particularly on the finish. But I nit-pick–this was Outstanding. 89-91 Points. 2006 Campion Pinot Noir: Retail $25. Well, I bought a bunch more of these and they are still doing well. I am not sure if I would be as enamored with this wine had I paid retail, but at the Wines Til Sold Out price of $15, this really is a no-brainer. A bit of cherry-cola and more than ample earth, this wine still has good fruit and Pinot character. Very Good. 87-89 Points. 2005 Fess Parker Syrah American Tradition Reserve: Retail $35. This is big. Not super, fruit-bomb, in-your-face, going-to-make-you-feel-like-you-are-drinking-ethanol big, but it is certainly hefty. Having said that, it is also tasty. Really tasty. Dark and brooding in the glass with cassis and anise wafting above the rim, on the palate, there is some surprising balance as the acidity admirably battles with the fruit. The finish is impressive, as is the wine. I am not a big brooding wine kind of guy, but this works. Well. Outstanding. 90-92 Points. 2010 Vinhos Sogrape Alentejo Callabriga (Portugal): Retail $16. Blend of Aragonez, Alicante Bouschet, and Alfrocheiro. More of a “New World” feel to this wine, with big, bold fruit, but there is also some nicely balanced acid. Surprisingly, some nice grip on the back-end as well. For the suggested retail of $16, this is a solid effort. For the $10 at the PLCB? This is another no-brainer. Very Good. 87-89 Points. 1993 Domaine Philippe Naddef Marsannay: Retail ???. I had no idea what to expect with this wine that I bought for a whopping $7 a few years ago. I popped it when I was alone–if it was horrible no one would know and if it was great, well, no one would know. While short of “great” it was really Very Good. Sure, it was tart and the fruit was faded, but the acidity was alive and busy balancing it all out. 87-89 Points. 2009 Panther Creek Pinot Noir Freedom Hill Vineyard: Retail $25. On the palate, this is Very Good, on the verge of Outstanding with some real depth and a great finish. But. The nose? Really Bretty. Normally, I do not mind the Brett, but it is on the verge of over-powering. Hold your nose until this gets in the mouth, and this is fantastic. Make the mistake of breathing through your nose, well, let’s just say I warned you. 86-88 Points. WINE OF THE WEEK: It seems like I write this a lot, but “it was rather difficult to choose the wine of the week this go around.” Honestly, before I popped it, I was sure that the NV Herbert Beaufort Champagne Brut Grand Cru Carte d’Or Tradition was going to be the wine of the week, but it came off being closer to a Blanc de Blancs than a Pinot dominated wine (and I prefer the latter style). Then there was the 2005 Fess Parker Syrah American Tradition Reserve, which I knew going in was not my favorite style of wine, but I was pleasantly surprised. And then there was the 1993 Domaine Philippe Naddef Marsannay, which would be nobody’s definition of a “blockbuster” but for a two-decade old village wine (and not the most highly respected village of the Côte de Nuits at that)? It was gangbusters. 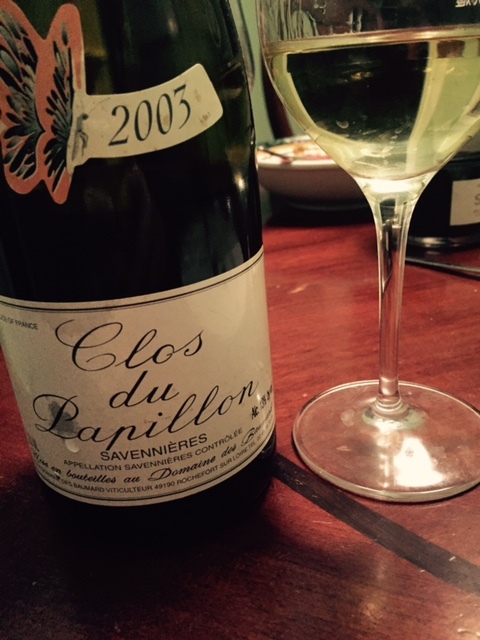 In the end, though, the 2003 Domaine des Baumard Savennières Clos du Papillon is this week’s Wine of the Week. There are few wines that I enjoy more than a Chenin Blanc from the Loire Valley and this was a wonderful expression of the style and variety. Given that the year was so difficult for so many in France (there was a Biblical heat wave that year), I would be amiss not to acknowledge that here. This entry was posted in Champagne, Chenin Blanc, Loire Valley, Pinot Noir, Portugal, Syrah, Wine. Bookmark the permalink. Adding these to my ever growing list of wines to try. My wine of the week is, bizarrely, a white. WHAT?! Now that I’m working through that wine century club application I have to play around and taste whites and this week I had THREE. My favorite was an Aligote by Louis Chevallier that I had at our local wine bar. Very good. Luscious. A White?!? Egads! 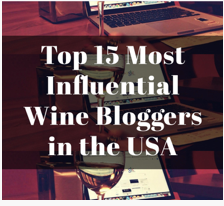 Actually, I think I appreciate whites more than reds—the winemaker can’t hide behind tons of fruit (or oak, usually), so he/she has to be on their game! I had my first Fess Parker (it was Frontier Red) at a Sideways-themed event last year. It wasn’t my favorite wine of the night, but was definitely drinkable. If you get a chance, try some of the upper end Pinots—quite tasty! The first weekend in March of the Grand Tasting at the Cincinnati Int’l Wine Festival … a grand event! Do you attend every year? I’ve attended many … and if possible, we like to go. Will again next year if time allows. FYI: The Hilton (downtown) usually has good rates for attendees … which are also linked at the festival’s website (winefestival.com).